The independent division of Playhut, GoLive2 has announced a new wireless and motion-sensing gaming controllers for PC and Internet – Stix, which allows users to play thousands of free online games as well as Games For Windows titles with an active, motion-sensing play pattern, aiming to redefine the PC and online gaming experience. Two versions of Stix gaming controllers will available at launch – Stix 200 and Stix 400. The Stix 200 adds active gameplay to 2D online gaming, while Stix 400 supports both 2D and 3D environments for the ultimate online and Games for Windows gaming experience. 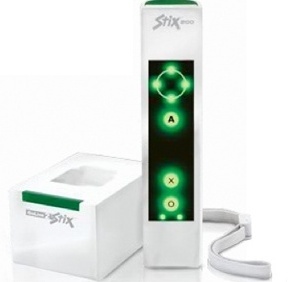 The new GoLive2 Stix motion-sensing gaming controllers with touch screen capability will be available nationwide in coming August 2008, but pricing has yet to be announced.